This week we are delighted to speak to the fantastic Nate Brown. 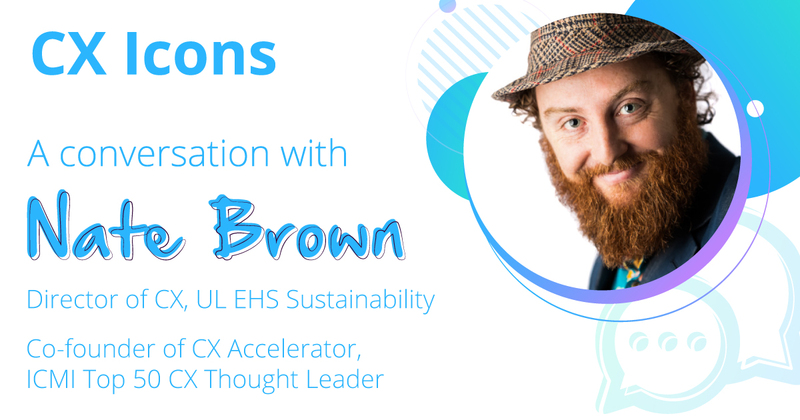 Alongside his role as Director of Customer Experience for UL EHS Sustainability, Nate is an ICMI Top 50 CX Thought Leader, and as co-founder of the CX Accelerator (a virtual forum for CX professionals) is something of a catalyst for communication amongst the customer experience community as a whole. Nate was also recently crowned CloudCherry’s Top Customer Experience Influencer, a victory made only sweeter by the quite awesome CX Champion wrestling belt that came with it (make your way to the end of the interview to see it in all its glory!). Hey Nate – firstly, thank you so much for taking the time to speak to us today! Would you mind telling us how you got started with CX Accelerator? It’s a fantastic community and great resource for anyone interested in customer experience. I think we can all agree that Customer Experience work is really difficult. With all the factors that can bring you down and burn you out, we needed something that could encourage us and build us up. CX Accelerator is that thing. The community is energizing and helpful because the people in it are so generous with their wisdom. It’s the perfect starting point for someone just emerging into CX, as well as a wonderful encouragement for veterans doing the work day in and day out. This first year has been incredible and we are just getting started! Are we in a boom time for CX or is it a discipline still finding its feet somewhat? Absolutely both. Organizations that are not making CX a part of their core strategy are border-line negligent. That being said, there is still a tremendous amount of confusion around CX and how to do it “right”. Customer Experience Management has so few anchor points that could be considered true best practices. Realistically, there are only guiding principles. Any experience design strategy requires a highly customized approach, placing tremendous responsibility onto the CX leader. It is a new frontier to be sure… and whether you identify more with Lewis and Clark or Captain Picard you will face challenges! A statistic from Forrester’s CX Predictions for 2019 had it that up to 89% of CX practitioners do not believe the ROI of CX is well established in their companies. How do you feel about this? Honestly, I feel deflated. We all know CX is the right thing to do… both intrinsically and mathematically for the long-term growth of an organization. So why is it so hard to prove? Many CX professionals are victims of a short-term revenue mentality. The company has quarterly numbers to hit and things like Customer Experience, which requires multiple years to properly develop, are not considered a priority for the long-haul. Showing the ROI of CX requires both a very capable Customer Experience leader and a very patient, customer-centric CEO. It’s hard, but it is entirely possible! Let’s encourage each other along the way and secure the future of CX together. Do you think there is a discrepancy between CX theory and actual practice? This is a great question. Nearly everyone loves to talk about making customers lives better. But then enters the reality. It’s amazing how the energy in the room can shift when you go past the “feel good” and start talking about knowledge management, effort reduction, implementing self-service channels, and other hard work required to actually improve experiences. The bridge from theory to action has to be Voice of Customer (VoC). It’s VoC that isolates the most critical priorities that can enhance the journey, and it’s VoC that can show whether or not these changes are making a real difference. Connect action to compelling customer stories on both the front end and the back end. This is how momentum is collected and big problems are resolved. In our recent conversation with Jeanne Bliss, she described the purpose of CX as ‘to unite the disparate parts of an organization to see what the customer sees’. Does this ring true to you? Would you say CX should play a uniting role for businesses? Far be it for me to disagree with the godmother of Customer Experience! Her “Chief Customer Officer 2.0” book is the best CX resource that exists today in my opinion. Jeanne has also said that the Customer Experience leader is the “architect of customer-driven growth.” I believe this is a brilliant metaphor. We can create a strategy and guide people toward the vision, but no CX function can build this structure alone! People across the organization will have to stand behind the effort with real action. I’m a huge fan of taking your VoC priorities and having each department head own at least one CX goal and one EX (Employee Experience) goal that will directly correlate back to the CX strategy. It’s important to tap into the accountability engine that already exists in the organization because it will be very difficult to create one yourself! As a Director of Customer Experience, what do you see as your primary responsibilities? What are the challenges you meet on a daily basis? The role is balancing the strategic with the tactical. We must be planning a year plus in advance, but we cannot ignore the present. There are things happening to customers today which impact loyalty and require immediate attention, but we cannot lose sight of the big picture. The biggest challenge is simply trying to do too much. Literally, everything impacts CX to some degree, and it’s extremely easy to become distracted. The best CX leaders are those that have the clarity of vision to focus on the very most important things and execute with diligence. Thanks so much for talking to us Nate, one last one before we go – any trends or technology that is really exciting you from a CX or Retail perspective right now? I’m thrilled at how technology is getting to the point where it can capture true customer perceptions. Surveys still have a place in Voice of Customer, but it’s a limited place. Better things are coming, and I love it! When CX pros are equipped with superior VoC data, we can be far more effective in our roles. A huge thanks to Nate for the time, as promised, a picture of his epic title belt below!